Janet wore a smile from the nose down; her eyes bore daggers. If I offered a Friday afternoon off for having finished a big project early, she “wished” it had been last week when she and her husband were headed out of town for the football game. When I ordered in pizza for everyone’s lunch to celebrate a staff anniversary, she had “hoped” for barbecue. When I congratulated a three-person team on finishing a custom course our client had raved about, Janet dropped a note on my desk “just FYI” that her co-worker Amy didn’t have anything to do with it — that she herself had completed the major part of the project without help. When I announced that our company would continue to pay health care premiums for all employees, she smiled and “guessed” she’d be “penalized” because she already had coverage through her husband’s firm and would just “lose” that benefit that others in the company received. Such is life when dealing with passive-aggressives. Recognize this behavior around your office? These individuals appear to act appropriately in any given situation — but they actually behave negatively and resist passively. They often play the “victim.” Their passive-aggressive actions can range from mild to extreme. Mild resistance — Making excuses for not doing, “forgetting,” blaming, “misunderstanding,” “teasing” remarks to hurt or let you know how they feel. In other words, they fear openly and directly communicating with you. So they communicate their resistance covertly. And dealing with them is sheer misery, much like dealing with a terrorist. You never know when they’re about to strike — until the damage has been done. I have dealt with something I have seen little written about. In my last church and the one I am in presently I had someone under me who was VERY passive aggressive. I had NO idea how much harm someone like this can do. Both of them were unexplainable. In my last church I realized that PA behavior was something that she did so subtly I didn’t realize it at first. The most recent one was a struggle to deal with, but she threw me under the bus as she was leaving for another church. It became such an issue that I called a guy in a church she served in Florida and he said she exhibited the same behavior there. At least it made me not feel like I was going crazy. My current pastor asked me to make sure she knew I was her “boss.” (She told me he was her boss. I asked who her supervisor was when the last guy was here and she said “Pastor Ryan.”) From that point, it went downhill. I had no idea the havoc these people can cause! I would love to read up on this more AND I would really like to know how to spot them in the interview process. (Both ladies were there when I was hired). Honestly, it was so bad that I never want to have to deal with it again. The CRAZY thing is most people can’t spot them!!! I had not seen this before in other places. Invite their input. 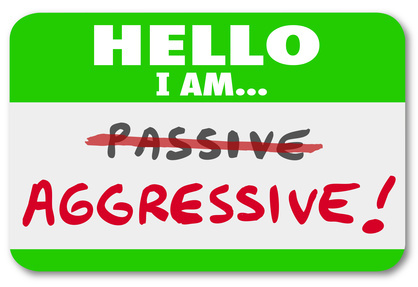 Some passive-aggressive people behave as they do because they feel they have no voice. When possible, ask their opinion on solving problems. You do not need to agree or disagree with their opinions or complaints. Tell them you’ll consider what they’ve said. Often, just inviting their input will satisfy them. Keep your sense of humor if possible and if the negativity is not extreme. Your passive-aggressive coworker reports to you that your project plan seems flawed and it looks as though the product will be delivered to the customer 14 days late. You smile and say, “Kevin, put on sunglasses and see if that flowchart looks any better. Or maybe we can highlight the spreadsheet in yellow and see if we get a brighter picture.” And then move ahead with your plans. Document official communication. If you have to interact with this person on an ongoing basis to get important things done, you can’t afford to let the situation “ride.” It will only intensify. If you need to give instructions or otherwise work with this person on a project, document actions in writing or have other people present for your discussions. Keep a written record and phone recordings of actions, who’s responsible for what, and deadlines. State consequences for their behavior. “Undercover” hostility and sabotage is the trademark of passive-aggressive people. When you confront these people with their behavior, they almost always will deny, make excuses, and blame other people. Despite what they may say, state what YOU are going to do to move forward. Tell them the consequences they will be facing if they persist in this behavior. Strongly stated, these consequences can compel them to stop obstructing and start cooperating. If none of the above techniques work and you control the situation, you may have to end the relationship. If you must continue to interact with this person, keep your distance as much as possible and maintain your composure while dealing with this challenging personality. After all, leadership includes such challenges — covert hostility as well as open conflict.